This story started, appropriately enough, one Halloween. My husband and daughter were out doing Halloween things and I was left to greet the Trick-or-Treaters. One of my earliest memories was a mystery to me for many years. I must have been three or four and my sister two years younger. My father answered a knock at the front door and a long line of strangely dressed people filed in, past my sister and me, sitting wide-eyed on the couch, on past my mother who handed each an apple, and out our back door. My parents obviously thought this strange occurrence was a good thing, and I don’t remember being frightened, but I was confused. My next memory of Halloween was a few years later, when my best friend, who lived in town, invited me to go with her on Beggar's Night. I was still puzzled by the experience and it wasnt until I was nine years old and we moved into town that I finally understood that dressing up and begging door to door was a regular Halloween adventure. Even after I understood the tradition, it was years before I connected that first strange experience to Halloween and it finally made sense to me. So as I opened the door that evening in 1993 to ghosts and goblins and fantasy creatures it was easy for me to put myself in the position of a child too young and inexperienced to know what was going on. At the end, of course, comes the satisfaction of understanding that this is an annual event that the child can participate in and look forward to. The rhythm and pattern came pretty quickly and I jotted some notes. Over the next weeks I worked to get the right number of images, actions, sounds and words to make the story work as a picture book. What would ghosts do? What are some good spooky words? I began with pumpkins, as the least frightening, and went on to ghosts, witches, ghouls and monsters, with the childs reaction getting stronger and stronger as he remembers last Halloween, until the final flip to this Halloween when hes got it figured out. The illustrations were lots of fun to do. Since Id already done one dark book, Rumble Thumble Boom!, I had some experience with the problems it poses and looked forward to the chance to do another. My art director suggested adding some onomatopoeic words to the art, as I had done with the thunder sounds in Rumble Thumble Boom!. It seemed like a good idea and I tried it, with moaning ghosts, cackling witches and shrieking ghouls. But it didnt work visually, so I abandoned the idea. I did one sample drawing with colored pencil on smooth white paper, coloring solidly with very dark colors. The art director was afraid the colors were too subtle and would get lost in the printing process. I went to black paper, as I had done before, using straight Prismacolors this time instead of aquarelles. It is a very satisfying way to work, to bring the lights out of the dark that way. Since I wrote the story in November, sold it in December, and had to finish the illustrations before Halloween came around again, one of the biggest challenges was to come up with costumes. I looked through my trusty family photo collection, and called on a neighbor who had three young children. Timmy, the youngest, had posed for the illustrations for an earlier book, and along with his sister Sarah and brother Michel, was eager to do it again. The three of them dug out their old costumes, borrowed others from friends and posed as witches, pumpkin, skeleton, Dracula, Frankensteins monster, Vampire, and ghosts. They loaned me pictures of themselves in other costumes too, and I found more costume ideas in the library and catalogues. As you can see, Timmy was also very good at making frightened faces. Association of American Booksellers Pick of the Lists for Children's Holiday Books! A little boy looks back on his experiences last Halloween, when he "was too scared to join in the fun," and declares that "this Halloween . . . I'm the scariest one." Hines' illustrations, designed for both Halloween veterans and children not yet ready to go trick-or-treating, show activity on both sides of the doorway. The black, nighttime backgrounds contrast nicely with the lighted interior of the house. The rhymes and pictures of the visitors depict the fun (and clearly mark the visitors as children in costumes) while still giving full coverage to the little boy's fears. Ages 3^-5. The chills and thrills of Halloween were a little too scary last year for the child narrating this book: "When the ghoulies came prancing, smirking and grinning, leaping and dancing, last Halloween ... I trembled inside." No princesses and cowboys came to the door that night, but rather a parade of monsters, ghosts, witches, vampires, skeletons, -and other spooky creatures traipsed to the house for candy while the small boy cowered inside. "This Halloween," he now vows, dressed in his splendid dinosaur costume, "I'm the scariest one!" Hines, using colored pencil on black paper, creates luminous nighttime pictures, with the trick-or-treaters looking appropriately childlike and festive but still creepy. However, the pictures succeed better than the words in conveying the message that the spookiness of Halloween is part of the fun. The text simply fails to convey the tone of its child narrator, sounding like the observations of an adult throughout: "I was tongue-tied," and "I whined and I cried." The winning pictures, the true-to-fife feelings, and the triumphant conclusion may make this one to purchase anyway. Age 3-6 yrs. A preschooler remembers hen the goblins came knocking last Halloween and how he ran and hid from all the trick-or-treaters. But this year, he's he scariest one! And the final double-page spread shows him dressed as a fearless dinosaur. Hines's rhyming text is a useful tool for coaxing timid little ones into their costumes. The illustrations' black background appropriately conveys the enjoyable spookiness of the holiday. Horn Book Copyright © 1996 The Horn Book, Inc. All rights reserved. When the goblins came knocking and the "pumpkins came walking, creeping and peeking, sneakily stalking, last Halloween..." the little boy in the story--like my children when they were toddlers-- was terrified. 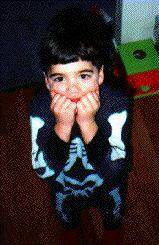 This Halloween, the reader discovers at the end, the boy is ready to be "the scariest one." With all the masks and costumes, moans and growls, Halloween can be a scary time for a young child. So, before trick-or-treating, you'll want to share Anna's parade of benign ghoulies and ghosties. The story of one child's coming of age. A year makes a big difference in a little boy's reactions to the scary, noisy creatures who come to his door on Halloween. A very understanding tale for young trick-or-treaters. When the Goblins Came Knocking is a tale (complete with wonderful rhymes) of the conversion of an apprehensive treat giver to a cheery scary trick player. The pictures are utterly huggable, the words sing right along and the ending will bring cheers all around. 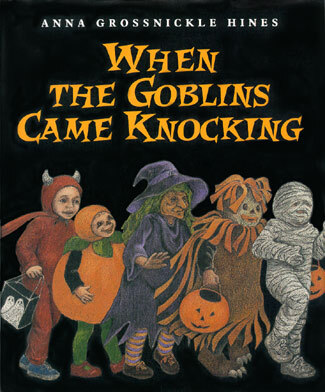 Everyone with children can appreciate Anna Grossnickle Hines' latest book - When the Goblins Came Knocking. Remember those Halloween nights when the kids were small and everything was oh so scary. Well, that's what this books all about. All those other children knocking on your front door easily can frighten your little ones. Those masks and those costumes, they can be intimidating to a child. Hines, who was born in Cincinnati, describes the memories her youngster had last year and his happy anticipation of this year's holiday. Oh, how different it'll be. This book is recommended for ages 2 to 5. When the Goblins Came Knocking by Anna Grossnickle Hines approaches the holiday from a different and useful perspective. A young boy remembers how frightened he was on the previous Halloween when a parade of ghosts and goblins arrived at his front door. But not this year, when he becomes the scariest of them all. Young readers who find the holiday season all too overwhelming and scary may identify with this one, especially with the illustrations that give a true kid's-eye view of the trick or treat parade. This season's cornucopia of Halloween books includes special treats for the very young. One parent pleaser covers that brief period when the novice trick-or-treaters are more frightened than excited. In When the Goblins Came Knocking Anna Grossnickle Hines describes in words and pictures the way costumes can intimidate. But reassuringly, that was then --this year, crows the protagonist, "I'm the scariest one!" In verse and easy rhythm, a young narrator describes last Halloween's frightful creatures and his reaction, but goes on to tell us that this year he is older and looks forward to joining the costumed crowd. The dark-toned illustrations suggest the child's fear and give atmosphere to the eerie holiday theme. This is a reassuring book for little ones who find Halloween "too scary."